VICTORIA, AUSTRALIA — Kangaroos, koalas, award-winning wines, and the breathtaking Sydney Opera House. That’s usually what comes to mind when we think of Australia. Yet an olive oil revolution is taking place Down Under. In much the same way that Australia turned the wine world upside-down with its outstanding, New World Shiraz wines, it is now doing the same with New World extra virgin olive oils. 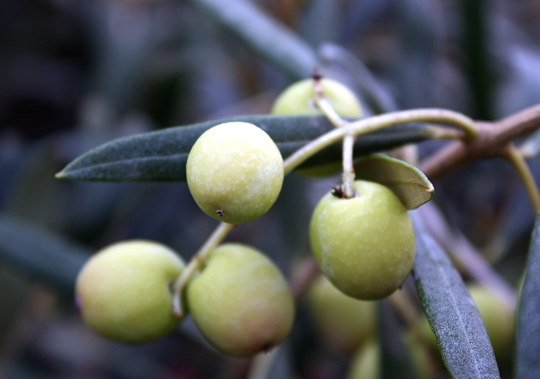 Boundary Bend Ltd., Australia’s leading vertically integrated olive company, which controls every production process from growing its own olives to pressing the oil to bottling, has been a pioneer in this new industry Down Under. 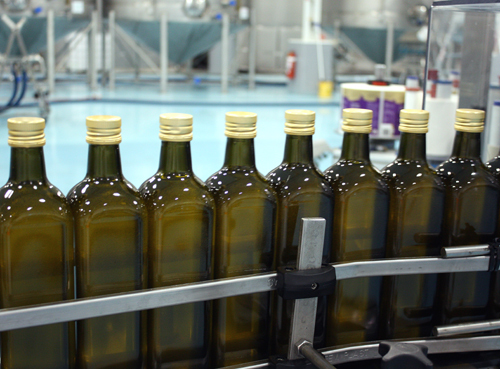 It is now the largest olive oil producer in Australia, and the top-selling brand there. This spring, I had a chance to see first-hand how it all came to be, when Boundary Bend flew me and a couple of other journalists to north Victoria state in southern Australia to tour its facilities and expansive groves planted with an astounding 2.5 million olive trees. 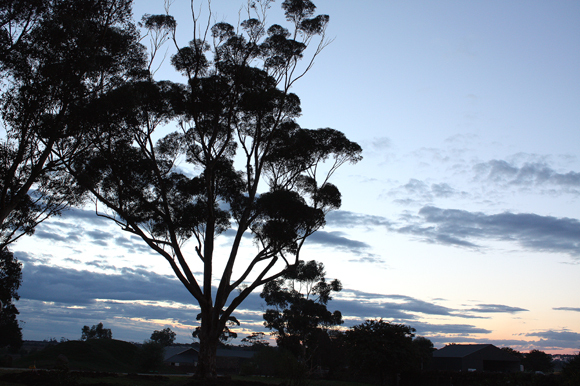 It is those trees, bearing 14 different olive varieties, which form the foundation for Boundary Bend’s award-winning Cobram Estate extra virgin olive oils. The brand, launched in 2001, is now exported worldwide. The olive oils can be found on supermarket shelves in Canada, the United Kingdom, Ireland, Germany, Hong Kong, Singapore, South Korea, and yes, the United States, where they are sold at Nob Hill, Raley’s, Bel-Air, Lucky, Andronico’s, Winn-Dixie, Fairway Markets and SaveMart (starting at the end of July) for about $6.99 per 375ml bottle. 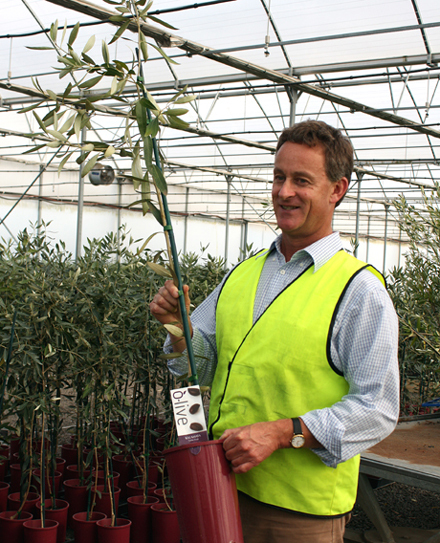 Boundary Bend hopes to distinguish its Cobram Estate extra virgin olive oils in two ways. First, it touts its freshness. 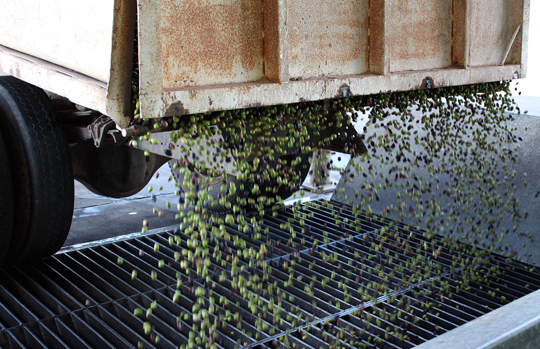 After its olives are harvested, they are pressed in less than six hours. The resulting oil makes it to market only two to 12 months later. Second, it stresses the strict testing its oils go through. At a time when fraud is reportedly rife in the olive oil industry — as documented in a superb 2007 New Yorker piece detailing how a significant percentage of Italian so-called “extra virgin” olive oil is actually adulterated with cheaper oils such as canola –- Boundary Bend is working with Australian government officials to strengthen standards for extra virgin olive oil made both domestically and imported into its country. After all, extra virgin olive oil is big business these days. From 1997 to 2007 alone, olive oil consumption grew by 100 percent in North America, according to the New Yorker article, much of it fueled by our new-found love affair with extra virgin. Made from the first pressing of the olives, extra virgin is considered the highest quality and best tasting olive oil –- and therefore the most expensive and most prestigious. Because it is the least processed, it also has the highest levels of polyphenols, a powerful antioxidant that can help keep hearts healthy. Rob McGavin had never made olive oil before co-founding Boundary Bend. But he was intrigued by its healthful properties, particularly after losing both his parents to cancer. McGavin, now executive chairman of the public company that grosses $40 million annually, grew up on a sheep and cattle farm in Queensland. After getting an advanced certificate in agribusiness administration, he talked his father into mortgaging the family house to buy a vineyard to grow grapes for winemakers. His small 35-acre vineyard eventually expanded to 600 acres. The grape-growing venture proved so successful that McGavin sold 80 percent of it in 2003 to the mega wine and beer conglomerate, Foster’s, for a handsome sum. With that tidy profit, he started his olive oil company. In Europe and China, olive trees are grown on many small, individual parcels of land and the fruit is still picked by hand. 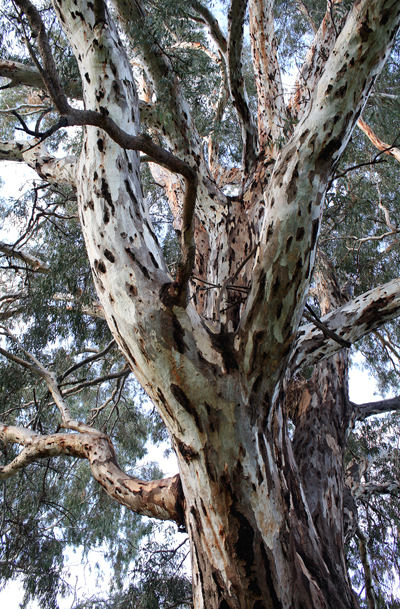 But in Australia, Boundary Bend grows its trees on enormous swaths totaling more than 16,000 acres in north Victoria state, near the banks of the Murray River. As we flew overhead in a small plane, the scene below was like one spellbinding enchanted forest. 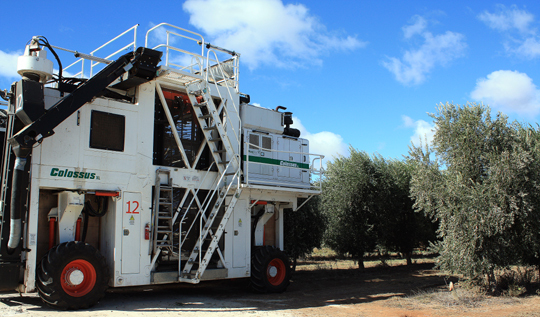 To pick all those Kalamata, Picual, Picholine and Hojiblanca olives during harvest time, Boundary Bend helped developed a state-of-the-art harvester called the Colossus. Each $800,000 machine can do the work of 8,000 human pickers. And Boundary Bend owns 22 of those harvesters. 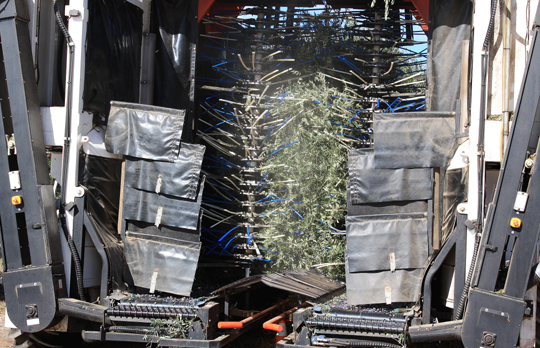 The machine, manned by two people, slowly makes its way down a row of olive trees, massaging the branches with rows of thin poles to gently pluck off the olives, which are then ferried up a chute and into the bed of an adjacent truck. When the truck is full, it deposits its load at the pressing facility on site. Olive oil is literally the juice of the olive flesh. Avocado is one of the few other fruits where oil comes from the flesh rather than the seed. 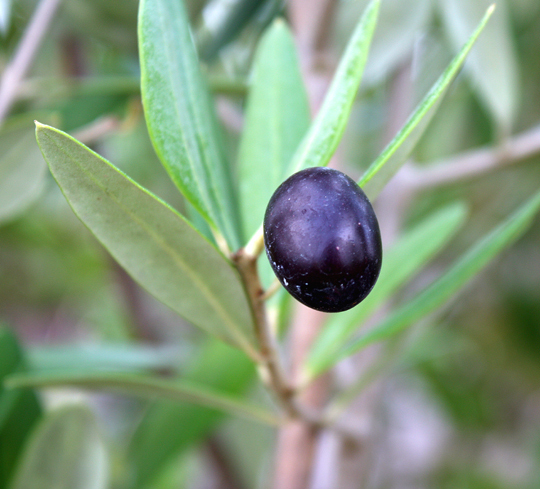 While tannins in wine come from the skin of the grapes, the bitterness of olives lies in its water, which is extracted from the oil. Because heat, light and oxygen can wrought havoc, the extracted oil is pumped into stainless steel tanks in a temperature-controlled storage room. Each tank gets topped with a layer of nitrogen to safeguard against oxidation. The olive oils also are sold in dark glass bottles to help preserve their flavor. 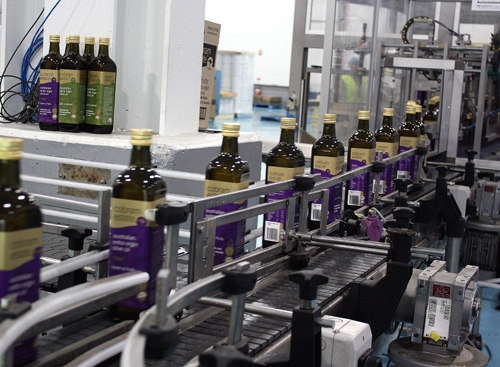 Last year, Boundary Bend produced 8 million liters of olive oil. In the next four years, as younger trees start to mature, that output will double. The real test, of course, is in the taste. 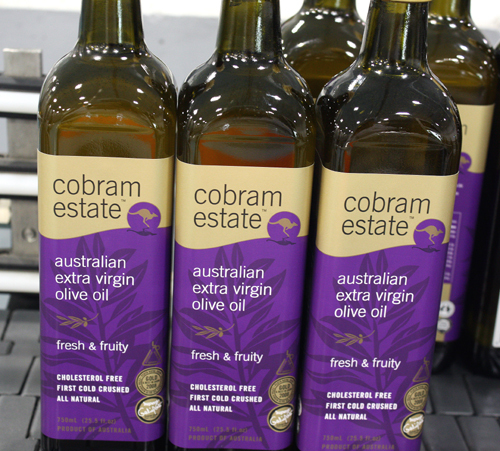 Leandro Martin Ravetti, executive director of Boundary Bend and its master blender, led us through a tasting of just-pressed Cobram Estate extra virgin oils, as well as ordinary, off-the-shelf European supermarket oils. The difference was striking. Each sample was poured into a small plastic cup, which we warmed in the palm of our hand as we held our other hand over the top of the cup to concentrate the aromas so we could better discern them. 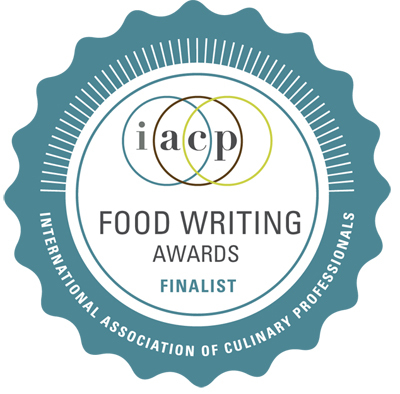 We took a whiff, then a sip of each oil, swirling it in our mouth to coat our entire palate before swallowing. 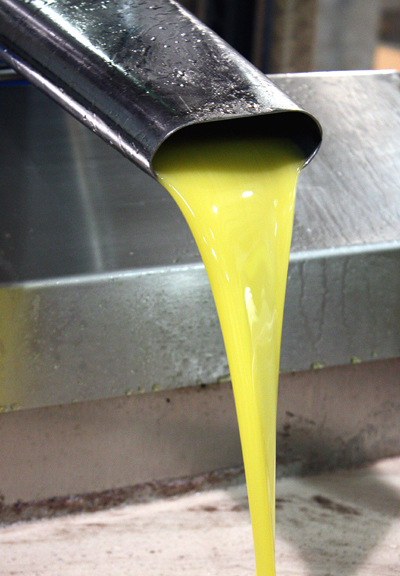 Freshness, balance, aroma, flavor and complexity are key characteristics of a great extra virgin olive oil. It should smell fresh and green. It should not taste fatty or greasy in the mouth, even if it is oil. It should have a clean finish. The Cobram oils all did taste remarkably fresh and vibrant, even if they differed in aroma and flavor — from the mesmerizing strawberry jam fragrance of the Manzanillo to the intriguing tomato leaf and peppery bite of the Picual. In contrast, the sample of an ordinary Spanish olive oil that had been bought at a supermarket not only smelled of apple vinegar and sharp citrus, but left a noticeably unpleasant oily film in the mouth — all signs that the oil had passed its prime and become oxidized. Before making this trip, I, like so many other Americans, had no idea that Australia even made olive oil. Now, after tasting the lovely Combram Estate extra virgin olive oils, I sure hope the word spreads about the wonders they’re creating Down Under. now darling I am so full of envy! lol! full of jealousy, truly! lol! how can you left me behind indulging all those olive all by yourself 🙂 You should have detour to KL! then we would have even more luxurious food! But definitely there is no enriching experience like your olive oil visit in Australia. You get lots of delectable street food though. Wow, how interesting. I never think of Australia having anything to do with olive oil but clearly I need to rethink that! Your pictures are really gorgeous. It’s obvious that a lot of care goes into their Olive oils. I’m impressed with the quality control. Are they planning on distributing the oil nationally in the future? Would definitely like to try it. It makes sense that when Australia’s wine industry grew that olive oil wouldn’t be far behind. 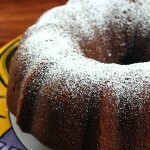 But olive oil really takes on the distinctive flavors of not only the olive but the ground that it’s grown. That’s why a lot of the Italian and Spanish olive oil has such a rich flavor because of the history of years of olive growing. Curious how Australia’s soil affects the flavors of their oil. Oh my! What a wonderful post and since down under is one of my fave places on Earth you brought back some good ole mamories. If their olive oil is as good as their wine, bring it on! Love Australia. 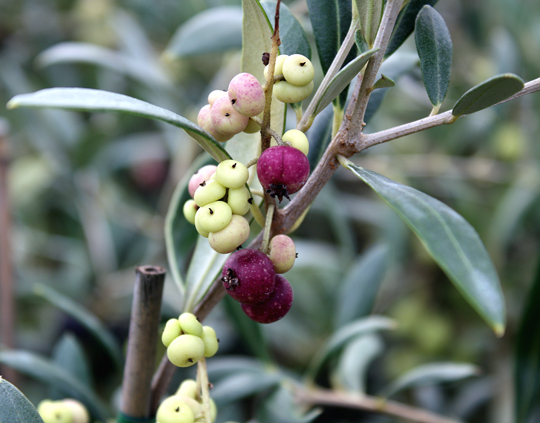 I’m going to Lucky to get some Boundary Bend/Cobram Estate olive oil so I can try it. Thanks for this post. So interesting! 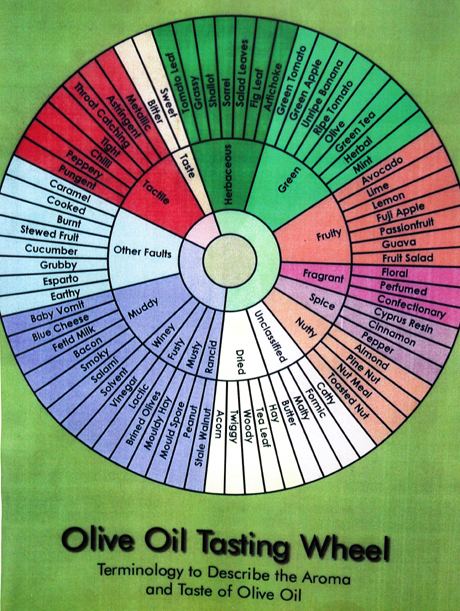 I recently sampled several extra virgin olive oils at a local oil and vinegar ’boutique.’ The differences are amazing. I became a fan of hojiblanca. I’ll be keeping an eye out for Australian olive oils now. What an amzing post! Pretty pictures of olives and olive oil. This is such a great post! 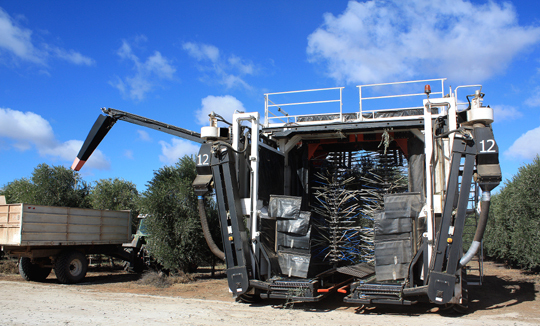 I did have to giggle at the name of the massive olive picker- ‘Colossus’- it seems so perfect from your pictures! Have fun down under, and bring us back some yummy recipes! 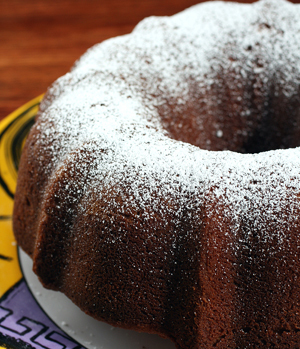 Olive Oil cake perhaps…? Wherever there is Mediterranean climate, you’ll find Mediterranean products like olive oil. Thanks for taking us along! I think there’s an olive oil tasting shop in downtown Campbell. Have you gone there? Australia! My, the lengths you go to for us! Looks amazing! Great photos, give you a sense of “being there”. Wow…this is such an interesting post! Carolyn, you are expanding my geography and food industry knowledge! 😀 Love all the pictures too. I hope I have a chance to visit such places. Thanks very much for sharing. Fascinating post from my home country! Funny, we have all of a sudden seen an influx of Australian olive oils at the tiny gourmet grocery around the corner from us in Toronto – guess they are making their name known a bit all over! 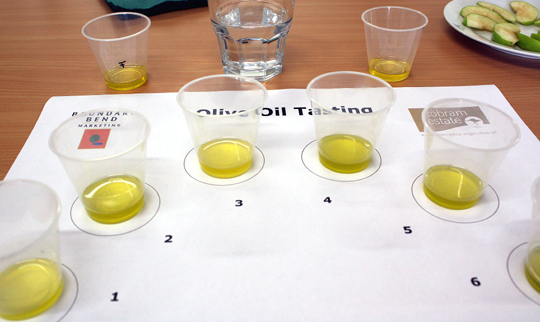 I recenlty attended an olive oil tasting and it was so interesting – who would have thought that oil could taste so different? This was a really eye-opening post, Carolyn! I had no idea Australia made olive oil. Wonderful detailed information. Thank you! I sure hope it doesn’t take forever for us to see Australian olive oils over here! I’ve spent so much of my life thinking that Italian olive oil is always the way to go, but I think I need to expand my olive oil horizons! They sell it at Whole Foods…I’m definitely going to pick up a bottle! LOVED the story Carolyn! Isn’t that machine huge? I’m really impressed by how quickly and efficiently they process the olives. 8 hours is quite amazing! ohhh austrialia. wow. lucky you. what a fun field trip. 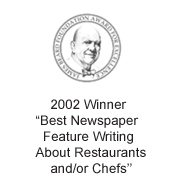 Nate: Thanks for the reminder about the Campbell olive oil store. 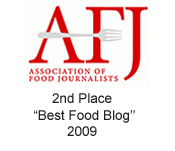 I’ve yet to visit, and I’ve heard many great things about the fresh tasting olive oils there. What a fun, educational and tasty trip. I loved the pictures following the process. Thanks for stopping by The Foreign Kitchen! I never would have guessed that Australia had such a vibrant olive oil production, very eye-opening and equally mouth-watering. Australia is certainly the best place to live! We love it here, and learnt a lot from your blog that we will have to definitely go see now you’ve opened our eyes! Wow! Really impressive. Pictures and text from 2010. Nowadays the prices in Spain are for an average quality at 3,50 €, virgin oil or brand names cost 5 to 7 €, per liter. To spend around $ 6.99 per 375ml bottle you may have to go to Madrid, where also Kings go shopping. I simply dare to say that such harvesters as this Colossus do not exist in the land of olives (in Spain’s southern province Jaen).